Ross’s poems are at once earthy and delicate and view their subjects through a perceptive, picaresque lens. I’ve learned cause and effect. catch the light of the sky like a bell. on into the night. How could it be otherwise? as if they were skywriting, fading white. But then, who am I going to talk to here? drawing dirty pictures of each other. "Ross pitches nothing less than stubborn belief in tenderness and in the patience both to look everywhere for it and to trustingly wait for it ('I would learn rare//and love and want and wait./I had to start at the beginning.') This a debut both tough and tender, the poems of a man who's been made to look away from the world plenty, and has found a way to look steadily back." 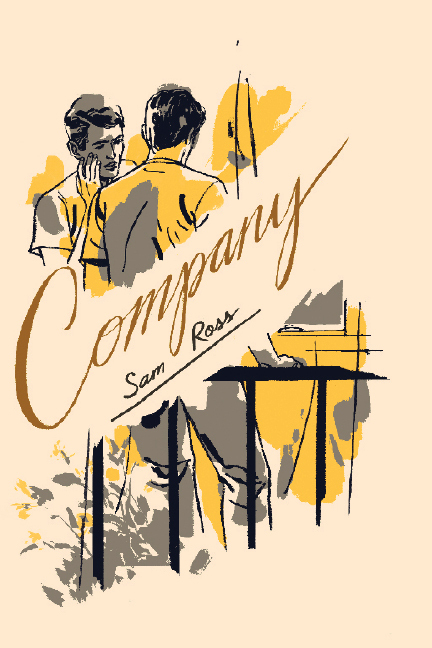 "...Sam Ross is an important poet because he writes of important matters: the life and death of kindness, survival under attack, the exquisite price of humanness...."
"...The poetry of Company displays a clear care for precision and a delicate approach to sentiment. Ross’s stanzas often break quickly, and his concision brings a gentle musicality to many of the poems here. Ross’s style allows his images—the terrible and precious alike—to emerge vividly. Company is a promising first collection, one that passionately offers argument for pursuing certain connections—perilous as they may be—and never loses sight of the work such connection requires: “I would learn rare // and love and want and wait, / I had to start at the beginning.” Read the full review.